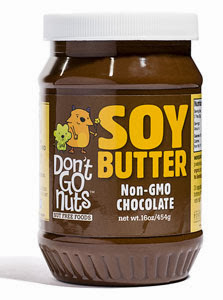 Don't Go Nuts is a line of Soy Butter spreads (and now Energy Bars) that are completely nut free. The spreads also happen to be gluten free & Vegan, as well. When they contacted us about using their products for an upcoming Holiday Recipe E-Book, I was excited to get my thinking cap on... Little did I know that my Sous Chef, Little Miss, would actually be the one to come up with our clever recipe submission! Lily Pinto is the inspiration for Don't Go Nuts. She was diagnosed with a severe peanut and tree nut allergy at the age of three. Don't Go Nuts is a division of Pinto Barn Inc. They believe they have a social responsibility. That's why the Don't Go Nuts products are made "field to fingers" - It's a first of its kind process to ensure every step of the journey to make their products is completely free from nuts. The Don't Go Nuts spreads contain no artificial anything! They're also Non-GMO, cholesterol free, and because their facility is brand new, their organic & kosher certifications are pending. Little Miss is lovingly referred to as my Sous Chef because she loves spending time in the kitchen with me, helping to create and bake recipes. It's a great educational and bonding experience. Now that she's spent the last few years so deeply inundated cooking and becoming more allergy aware, I often find her with a bowl and spoon coming up with her very own creations in the kitchen. This recipe, as mentioned above, happens to be one of her ideas! We make pancake muffins (or as they're sometimes referred to as "puffins") quite often for the school weeks. They're easy to bake and freeze, so I can just quick reheat for her in the mornings before we hurry off to the bus stop. One morning as I was heating up some of her pancake muffins, Little Miss stood off to the side of me "creating", as she called it, by mixing up some strawberry yogurt and Chocolate Soy Butter to eat. 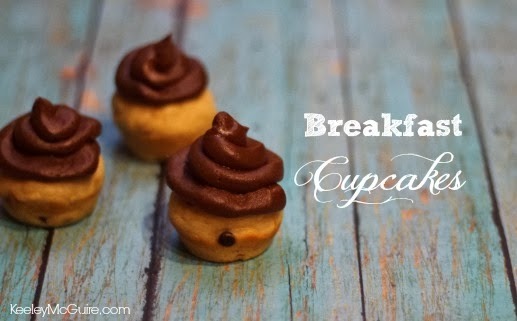 As she took individual bites of each of the pancakes, and then her yogurt mixture, she decided to eventually ice her muffins with the mix instead - thus creating the perfect little "breakfast cupcake". I loved it! And so did she. 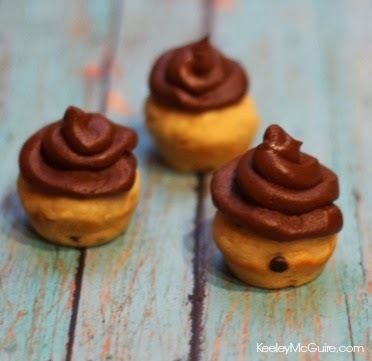 Her idea sparked me to next time whip up Mini Soy Butter Chocolate Chip Pancake Muffins and then measure out her delicious icing mixture to create the recipe instructions. The best part? These little cuties are gluten free, egg free, dairy free, peanut free, & tree nut free. They're also packed full of protein! Enjoy! You can download the FREE Recipe E-Book "Grateful Gatherings" from the Don't Go Nuts home page or click here for the direct link to the PDF. Here's the recipe for our cupcakes! 2) In a large bowl, combine your flour, baking powder, oil/ applesauce, and flax. 3) Slowly add 2.5 Cups of your 3 Cups of Non-Dairy Milk required. Add 1/2 Cup of Don’t Go Nuts Soy Butter. 4) Mix until a smooth batter is formed. Gluten Free Flour often requires more moisture. It was at this point I slowly added in the last 1/2 cup of Non-Dairy Milk, as needed, to smooth out the batter. 5) Lightly grease a mini muffin tin pan. Fill each cavity about 3/4 full with the batter. 6) Bake for 20-22 minutes – or until it passes the “toothpick test”. 7) Remove from oven and let cool in pan for 3-4 minutes, then transfer Pancake Muffins onto a cooling rack. 8) In a medium size bowl, combine yogurt and Don’t Go Nuts Chocolate Soy Butter. Mix until a smooth “icing” is formed. 9) Once the muffins are cooled, spread the icing onto the muffins with a knife or pipe on as you would a cupcake. Recipe yields 48 mini pancake muffins. Store in an airtight container in the refrigerator for up to 3 days or freeze “un-iced” for up to 3 months.